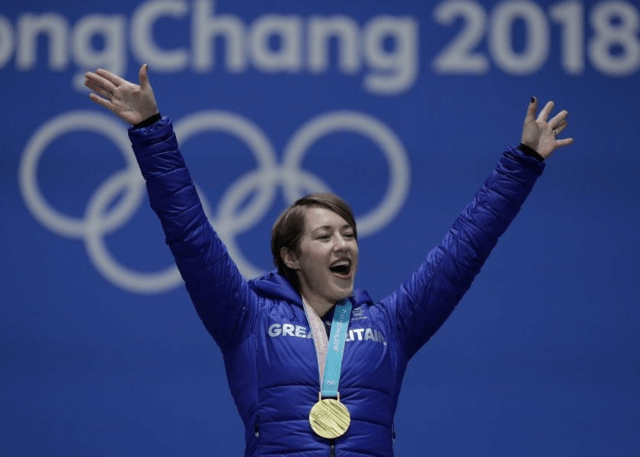 Lizzy Yarnold MBE forever established her place in sporting history after triumphing in every major title in her sport of skeleton in just 407 days. With consecutive Olympic gold medals in 2014 and 2018, she is the most successful British Winter Olympian and the most successful Olympic Skeleton athlete of all time. Lizzy won her first World Championship gold medal at the 2015 event in Winterberg, Germany (with two official track records) adding to her Grand Slam collection of Olympic and European titles and the overall World Cup title in the 2013/2014. Lizzy is the second athlete ever and the first British slider to hold all three Grand Slam titles at the same time when she was the Olympic, World and European Champion. Lizzy achieved Gold at the Olympic Skeleton event in the 2014 Sochi Winter Olympics, and she won having led the field in every training run leading up to the Games and over the entire 4 race event – her winning margin of 0.97 seconds was the largest ever recorded. She followed this up in 2018 by representing Team GB and winning her second Gold medal. Yarnold was also the flag bearer for Great Britain at the Pyeongchang opening ceremony. Lizzy was awarded an MBE for Services to Sport in June 2014. A Geography and Sports Science graduate, Lizzy is passionate about environmental issues and encouraging healthy role models for young people. She feels very strongly that she wants to use her success on the track to help young girls feel better about their body image and to become more active in sport. Since her Olympic triumph, Lizzy has visited over 50 schools across the country spreading that message.